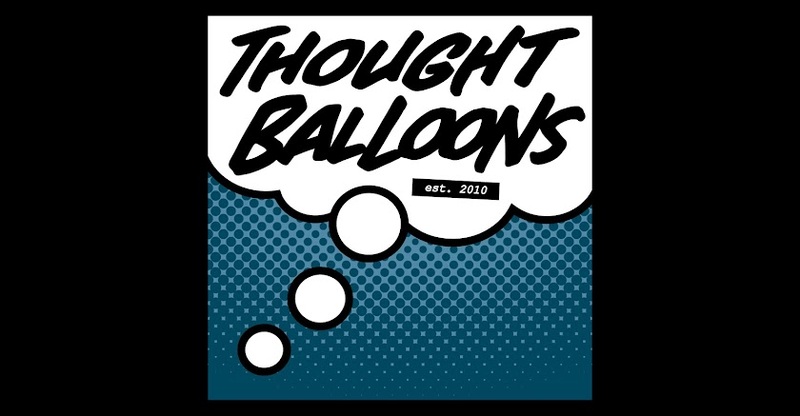 Every group has its share of comings and goings and this week sees another round of that for the Thought Balloons crew. As you may have already noticed, Derek Adnams hasn't been around these parts much of late, and that is because he has had to take his leave to focus on other comic book projects. Of course, we're sad to see him go, but we're very excited to discover what treasures he's currently whipping up with his various collaborators. It was a great pleasure to have you along, Derek, and we hope you'll keep visiting from time to time. Happily, as you may have already gathered from his lovely script this past week, your friend and mine David Press has agreed to join our gang full time. It's been a true delight seeing his play-at-home scripts these past few months and to have him jump on with the Writer-in-Residence program, so we're only more excited to have him stay on as our latest Tenured Writer. His scripts have been a joy to read and we're all rather eager to see what stops he'll be pulling out in the weeks and months to come. David Press lives with his librarian/musician wife in New York’s Adirondack Park. By day he teaches writing, comics, and film at Paul Smith’s College. Currently, his nonfiction writing has been featured in North Country Living Magazine and the Adirondack Daily Enterprise. Dave has been obsessed with writing comics since he was thirteen-years-old starting with Mark Waid and Mike Wieringo’s run on The Flash. He’s currently revising a novel called Emerson, which follows two high school students who realize that their writing can alter reality. He is a graduate of Brooklyn College and St. Bonaventure University. He leaves his notes at davidpress.net. So thank you once again, Derek, and welcome aboard, David! And don't forget for those reading at home, you too can play along by posting in the comments for each week's Why? post. We're always happy to see new faces, so don't hesitate to consider throwing your hat into the mix.